Your Excellencies, distinguished speakers, and honored guests! It is my sincere pleasure to participate in the panel discussion here at the Parkhotel Schonbrunn in Vienna. I am also bringing the greetings and appreciation of Dr. Hak Ja Han Moon, Co-Founder of WFWP, who wishes to encourage and convey her love to all of you for your great endeavors for empowering women and promoting peace in your own fields. The theme of the discussion today is “Values Education and Healthy Families - Fostering and Environment for Prosperity, Citizenship and Interreligious Harmony.” To be effective, this debate must be taken seriously on many fronts: in early childhood education in families, in school curricula and in broader socio-cultural relations. Ever since WFWP’s establishment in 1992 in Seoul, Korea, Dr. Hak Ja Han Moon and her late husband, Rev. Sun Myung Moon, as co-founder and the biggest supporter of empowering women’s rights, worked to promote an ideal of “One Global Family under God,” and a culture of interdependence, mutual prosperity and universally shared values. Their efforts through various volunteer and educational programs brought us closer to the realization of an era of peace, harmony and coexistence. Moreover, they have created dozens of peace and education-based organizations touching many issues and concerns of today’s world. One of the most recent is the Hyo-jeong Academy, an institution that develops academic curricula and training programs for youth with the intention to cultivate global citizens and future leaders of integrity and compassion. The critical question is how to make a peace culture sustainable, from generation to generation, at this time when the selfishness of nations in pursuing only their own interests has pushed harmony and unity further away. To counter this ongoing plight, WFWP emphasizes that the real cement of a Culture of Peace has more to do with true love, which is the implementation of a lifestyle of living for the sake of others and a sense of responsibility for creating a better environment for future generations. Even the SDG Preamble got it right, “No one will be left behind”. I would like to remind you of the founder’s vision concerning the role of the family, especially women, in creating a sustainable harmonious world, as the peacemaker of the 21st century. “Peace must first be realized in the individual and in the family, because these form the basic unit for all human organizations and systems. When true parents, a true husband and wife, and true children all attend God and form a true family of peace, and when that family expands to form a clan, nation and world, a true world of peace will be realized. The role of the mother and wife in creating peace in the family is an absolute and eternal one. Thus, participation by women is needed in all aspects of society, from diplomacy and politics to the economy and legal system reform. Women also need to be active in education and culture, in sports and the arts, not to mention the diverse activities of NGOs. While I would have more to say on this pivotal topic, I also look forward to listening to your thoughts, activities and proposals. We cannot bring about the changes we want to see, alone. Only by collaborating with like-minded leaders and practitioners, especially in the fields of education, law, media, religion and culture who are working together for a common purpose, can we bring about a true culture of interdependence, mutual prosperity and universally shared values. This in fact is the vision behind the inauguration of the Inter-religious Association for Peace and Development (IAPD) today. It is a vast network of people and associations, ultimately interlinked through our desire to secure a world in which children can really grow up free to develop their goodness and make a unique contribution to a flourishing peace culture. A graduate from the Department of Sociology at Ewha Women’s University, South Korea, Prof. Moon completed in 2003 a Masters of Theology at the Unification Theological Seminary, USA. In 2008 she was awarded an Honorary Doctorate in Theology from Sun Moon University. After serving for many years as its vice-president, she was appointed president of Women’s Federation for World Peace, International in May 2014. 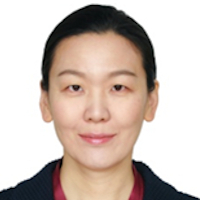 She is a Professor at Sun Moon University, President of the Sun-Hak Scholarship Foundation, Director of the Universal Cultural Foundation and Chairperson of the HJ World Peace Foundation, among many other attributions.